View our current selection of Gemstone Rings. 14K Solid White Gold .45 Carat Emerald and Diamond Flower Twist Ring. A strong, masterfully crafted design in 14 karat white gold. Two shiny arms – sparkling with the incomparable shimmer of 3 precious channel set round diamonds on each side - caress the emerald and diamond centerpiece. 16 round diamonds weigh .45 ct tw and the center Emerald weighs 1 carat. An elegant and unique piece meant to treasure forever. 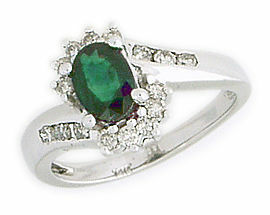 We guarantee our 0.45 Carat Emerald and Diamond Flower Twist Ring to be high quality, authentic jewelry, as described above.